Not to be confused with Cyprus. This article is about plants called cypresses. 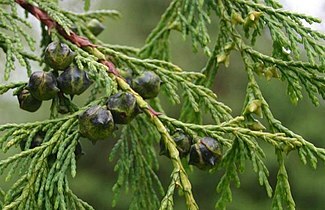 For other uses, see Cypress (disambiguation). 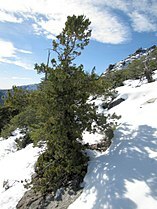 The Cupressaceae family also contains 13–16 other genera (not listed above) that do not bear cypress in their common names. The Cypress. A poem by Letitia Elizabeth Landon from The Amulet, 1826. ^ Pauw, C.A. ; Linder, H.P. (1997). "Widdringtonia systematics, ecology and conservation status". Bot. J. Linn. Soc. 123: 297–319. ^ Thomas, P.; Yang, Y.; Farjon, A.; Nguyen, D. & Liao, W. (2011). "Glyptostrobus pensilis". The IUCN Red List of Threatened Species. IUCN. 2011: e.T32312A9695181. doi: 10.2305/IUCN.UK.2011-2.RLTS.T32312A9695181.en. Retrieved 9 January 2018. ^ a b Farjon, A. (2005). Monograph of Cupressaceae and Sciadopitys. Royal Botanic Gardens, Kew. ISBN 1-84246-068-4. ^ "Actinostrobus". Flora of Australia Online. Department of the Environment and Heritage, Australian Government. ^ "Callitris". Kew World Checklist of Selected Plant Families. 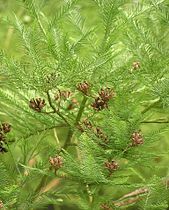 ^ "Chamaecyparis". Kew World Checklist of Selected Plant Famlies. ^ Conifer Specialist Group (1998). "Fokienia hodginsii". IUCN Red List of Threatened Species. Version 2006. International Union for Conservation of Nature. ^ Luebert, Federico; Pliscoff, Patricio (2017) . Sinopsis bioclimática y vegetacional de Chile (in Spanish) (2nd ed.). Santiago de Chile: Editorial Universitaria. pp. 192–195 and 208–209. ISBN 978-956-11-2575-9. ^ Hogan, C. Michael; Frankis, Michael P. (2009). 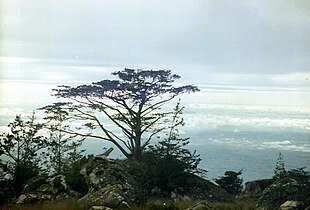 "Monterey Cypress: Cupressus macrocarpa". GlobalTwitcher.com. 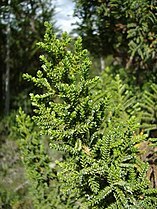 ^ "Cupressus nootkatensis". PLANTS Database. United States Department of Agriculture; Natural Resources Conservation Service. 2015. This page is an index of articles on plant species (or higher taxonomic groups) with the same common name ( vernacular name). If an internal link led you here, you may wish to edit the linking article so that it links directly to the intended article.